Planning on installing a security light, attaching a wall-mounted mailbox or constructing a deck? All of these DIY jobs require you to find the studs from the outside of the home. The exterior cladding and boxing make an electronic stud finder ineffective because they're too thick and solid to get accurate readings. You could spring for an expensive X-ray unit, but most homeowners prefer an easier and cheaper approach to finding studs in stucco, siding and other materials. Today's structural codes require builders to space wall studs uniformly to accommodate plywood and other 4-foot-by-8-foot sheeting materials. The most common stud spacing is 16 inches on center, which means the center of one stud is 16 inches from the center of the next stud. Stud spacing might be different, though. In some cases, you can find studs on 24-inch centers or even 12-inch centers. 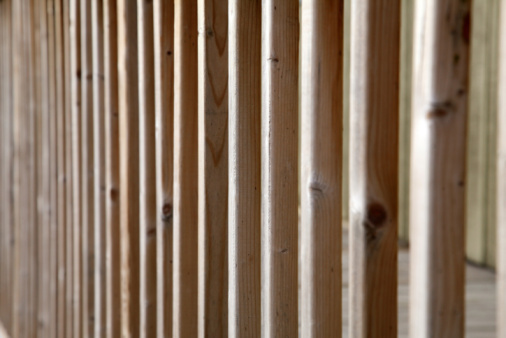 Builders use an outside corner as a reference point when framing walls, so you might be able to start at an outside corner and measure in 16 or 24 inches, plus the thickness of the siding, and find exterior wall studs. This technique doesn't always work, though, because the builder might have started framing at the other end of the house. If the house has a crawl space or an unfinished basement, examine the joist layout from below to see if you can determine which corner the builder used as a reference point. Wall studs often sit directly over floor joists. If your home has old cedar siding, you may be in luck. This type of siding was top-nailed. If you see a vertical line of nail heads through layers of old paint, you're in luck. A wall stud lies beneath. Newer types of siding are blind-nailed so each strip of siding overlaps the nails of the strip below. That means you won't see an obvious row of nails on the siding. You might be able to carefully pry the bottom edge of a strip of fiber-cement or other hard-type siding up just slightly with a nail bar and peer underneath to find a nail. For vinyl siding, use a vinyl siding removal tool to unsnap the seal between two pieces of siding, allowing you to see the nail heads. For solid cladding, such as stucco or brick, your best bet is to locate the studs inside the house and then transfer the measurements to the exterior wall. 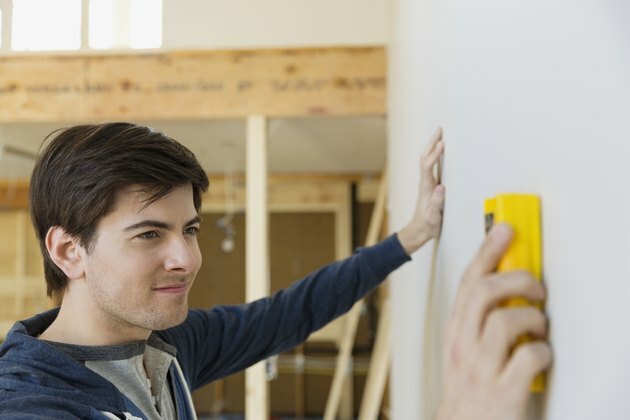 Use a good quality stud finder or rap firmly on the wall and listen for a solid sound, indicating a stud is beneath. You can also check base molding or crown molding for filled nail holes, which indicate stud location. Another clue is the location of outlets and switch boxes because one side should connect to a stud. 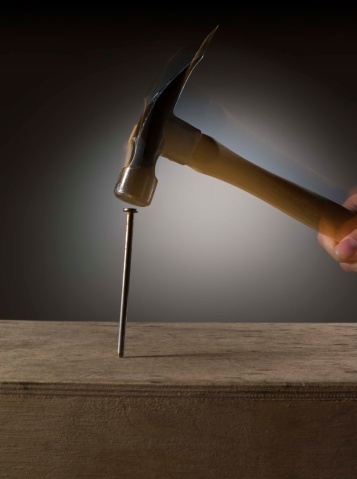 Once you think you've found a stud, drive a test nail to determine the outside edges and center of the stud. Finding studs around windows is an effective way to transfer measurements from the inside to the outside of your home. The glass in the window gives you a constant on both sides of the wall. If possible, measure from the edge of the glass in the nearest window to the stud. Measuring from door or window trim is often inaccurate because trim dimensions are often different on the inside and outside. The edge of the glass, however, is identical on both the inside and the outside, making it the best way to find a stud in your wall. If the wall is windowless, transfer the measurements by adding the thickness of the wall to the distance from the inside corner to the stud. For example, if you locate an interior stud 12 inches from the corner, add the thickness of the drywall, usually 1/2 inch, plus the thickness of the studs, which is 3 1/2 inches if the studs are two-by-fours. Add another 1/2 inch for the boxing and 3/4 inch for standard lap siding. Add the 5 1/4-inch thickness of the wall to the 12 inches. From the outside, hook the tape measure over the outside wall corner and measure in 17 1/4 inches, and you should find a stud. Adjust wall thickness measurements accordingly for thicker walls. Finding studs on the outside of your home is a little more challenging than interior stud location. But using standard building information and taking accurate measurements can help you do the job.